Since its inception in 1971, the RIMPAC exercise has provided the opportunity for the U.S. Navy to build organizational partnerships across the Pacific. These partnerships serve not only to cement alliances, but also to make coordination easier in times of crisis. The potential for maritime cooperation in disaster relief loomed large during the exercises this year as well, and was specifically mentioned by USN officials. But the exercises (which included several submarines, not noted for their disaster relief capabilities) demonstrated capabilities beyond disaster relief, as participating navies took the opportunity to sink several retired U.S. vessels. As a regularly scheduled biennial exercise, RIMPAC happens regardless of the extant political situation in the Pacific. However, the absence of the People’s Liberation Army Navy – and the participation of Russia and India for the first time – combined with new tensions in the South China Sea, leaves the unavoidable impression that these exercises are geared towards managing the increasing naval power of China. This year’s RIMPAC exercise took place against the backdrop of an unusually open debate about the future of U.S. maritime strategy in East Asia. The Obama administration’s “pivot” pledges a redistribution of U.S. military effort to the Western Pacific. The development of AirSea Battle, at least at tactical and operational levels, promises to enhance the ability of assets from different organizations to cooperate. China has viewed these debates with considerable concern. RIMPAC exercises go well beyond facilitating strategic “handshakes,” giving navies the opportunity to work on skills that they cannot develop in isolation. If AirSea Battle is a “help desk” for complex modern warfare, then RIMPAC is somewhat akin to the development of a “Geek Squad,” capable of applying expertise to a variety of unpredictable problems. 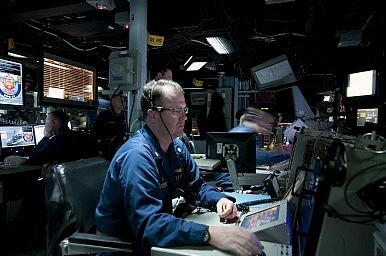 As much as anywhere, the need for practice and coordination is evident in the field of anti-submarine warfare. ASW requires truly monumental efforts at coordination between air, surface, and subsurface assets. A wide network of sensors needs to communicate effectively with a wide variety of weapons platforms. The ships, subs, and aircraft participating in RIMPAC not only developed their skills for anti-submarine warfare, but also developed the relationships necessary to communicate effectively in an anti-submarine context. Again, the unspoken focus of such exercises is the PLAN. Although Chinese Anti Ship Ballistic Missiles (ASBMs) have received a great deal of attention in recent years, the PLAN’s submarine force continues to grow in size and sophistication. A recent study by the Jamestown Foundation focused on the further development of China’s nuclear-powered ballistic missile submarines(SSBN) force, currently at five boats. The PLAN has also modernized its fleets of diesel and nuclear attack boats. Chinese submarines have played games with American carriers that bear uncanny resemblances to the exercises undertaken at RIMPAC. To be sure, the RIMPAC exercises will not lead to a potent anti-submarine coalition of the sort that NATO once created in the North Atlantic. Participating nations would need to integrate their systems of sensors together, and build the trust necessary to rely on one another in times of crisis. Many of the RIMPAC participants offered only staff-level assistance and coordination, and certain critical countries (such as Vietnam) were entirely absent. But at a minimum RIMPAC serves to provide navies with a foundation for communicating with one another in times of crisis, in terms of both relationships and basic skill sets. And while China might seem the most likely target of anti-submarine preparations, the sinking of the Cheonan in March 2010 served as a reminder of the threat posed by even small, inexpensive submarines. In sum, China is surely correct to view the RIMPAC exercise with concern, but the exercise isn’t just about China, even to the extent that it develops skills beyond disaster relief. Dr. Robert Farley (@drfarls) is an assistant professor at the Patterson School of Diplomacy and International Commerce at the University of Kentucky. He blogs at Lawyers, Guns and Money and Information Dissemination. A Chinese film showcases the increasing might of the People's Liberation Army Navy.